Although classically regarded as being an intracellular molecular chaperone, many studies have reported that the 70 kDa stress protein can be released from a number of different cell types in the absence of cell death. 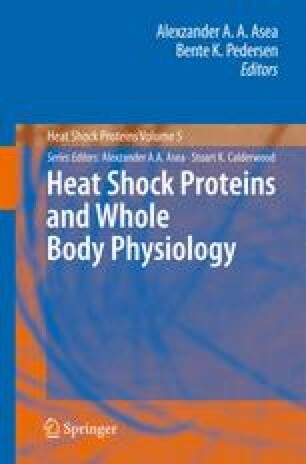 Furthermore, we and others have reported the presence of Hsp70 in the circulation of normal individuals, and levels of this protein in the peripheral circulation can be increased by a number of physical and psychological stressors. The question is: what is the physiological role of circulating Hsp70? Extracellular Hsp70 has been reported to have a number of neuroprotective and cytoprotective properties, and we have shown that high serum levels of Hsp70 protect individuals with hypertension from the development and progression of cardiovascular disease. It might therefore be that extracellular members of the 70 kDa stress protein family have multiple roles in the maintenance of physiological homeostasis which extend beyond their more commonly accepted properties as immunoregulatory molecules. Perhaps this ubiquitous family of stress proteins could also be considered as exogenous cytoprotectors.